Outdoor Lighting sales and service, Landscape lighting installation. No Home Is Complete Without Outdoor Lighting. Automated Equipment is a Registered Nightscaping® Contractor. Take advantage of this opportunity to see the beauty you’ve been missing in your landscape. This is your chance to simultaneously enhance the safety, security, value and visual appeal of your home with warranty protected, professionally engineered, premium quality landscape lighting. 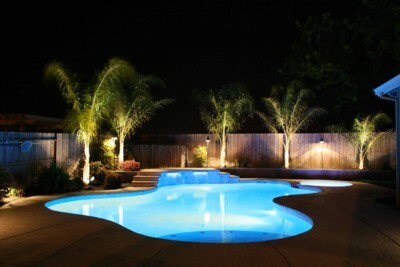 It is impossible to utilize one’s property to the fullest extent without outdoor lighting. A professionally installed low-voltage landscape lighting system will simultaneously increase the security, safety, beauty, and resale value of any home. Automated Equipment uses professional landscape lighting products based on the brand’s selection, optic quality, extensive guarantees and overall excellence that will optimize your project. 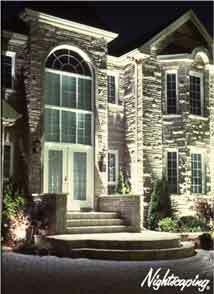 Automated Equipment can illuminate your walks, drives, entrances, gardens, trees, patio areas and more. The freedom to emphasize the features of your property that you find most attractive is an added benefit of working with a professional designer. Every Automated Equipment installation is custom designed with the individual homeowner in mind. For more information on how Automated Equipment can turn your home into an alluring display of light and architecture please contact Automated Equipment at (209) 669-6970 for a free demonstration that will change your evenings forever. Please take a look at a few good reasons to light your home or special occasion. Why use outdoor / landscape lighting? Why you might use 12 volt over 120 volt lighting? Are you planning a special occasion ? Are you concerned about your familys safety at night?